Long One T20, Five ODIs and Two Test Match Series between Pakistan and South Africa in UAE has finally end today as second test match was also drawn between both teams. South Africa declared its second innings on 203 runs for loss of 5 wickets and given target of 354 runs to win for Pakistan on 5th day. Pakistan lost 3 quick wickets but later of Misbah Ul Haq Played very well and Pakistan was able to make 153 runs for loss of 3 wickets at end of day 5. 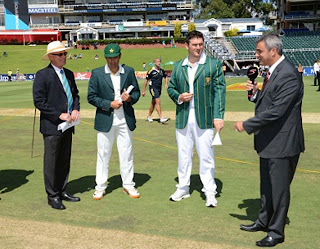 The Test Series is drawn by 0-0 between Pakistan and South Africa. before this South Africa defeated Pakistan in T20 and ODI Matches.